If you've been on a beauty blog or YouTube in the past year or so, you've probably heard of one of the most popular concealers out there: the Tarte Shape Tape. It claims to have high coverage, multiple uses, and not settle into fine lines and creases. I've had this concealer for months and while I like it, it's not something that I want to spend more than $20 on. So when I started hearing about an affordable dupe for the Shape Tape, I was really excited. I figured that even if this drugstore dupe wasn't exactly like the Shape Tape, maybe it could still become a staple in my collection. The dupe that I'm referring to is the new Makeup Revolution Conceal and Define! Makeup Revolution was really popular in the UK, and has had similar success here in the US since it came to Ulta. This concealer has been going in and out of stock since it launched at Ulta, so I'm glad I got a hold of it while I could! 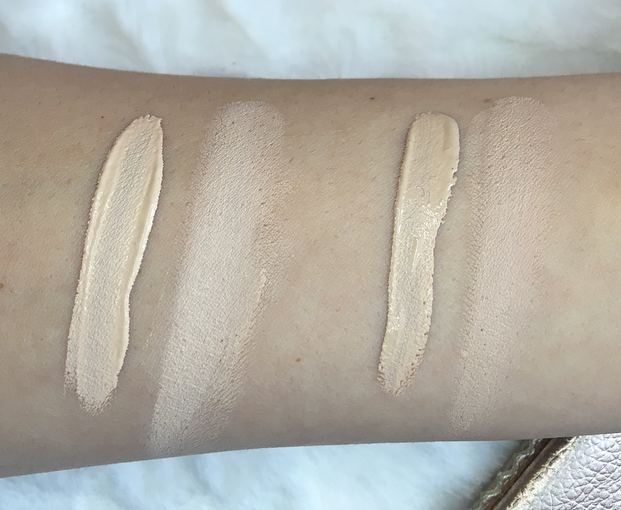 I've been trying and comparing the Conceal and Define to the Shape Tape for about two weeks now and I can compare and contrast them. Makeup Revolution is well known for duping high-end products, but in this case there don't seem to be many similarities between the two concealers. At first glance, the only thing similar with these concealers is that they both have big doe-foot applicators and wide tubes. The Tarte concealer has a purple and gold lid and the MUR one is plain rose gold. I personally like the look of both of the concealers, although I would have preferred a smaller applicator on both! The Shape Tape concealer retails for $27 and the MUR concealer is only $7, but you get much more product in the Shape Tape. 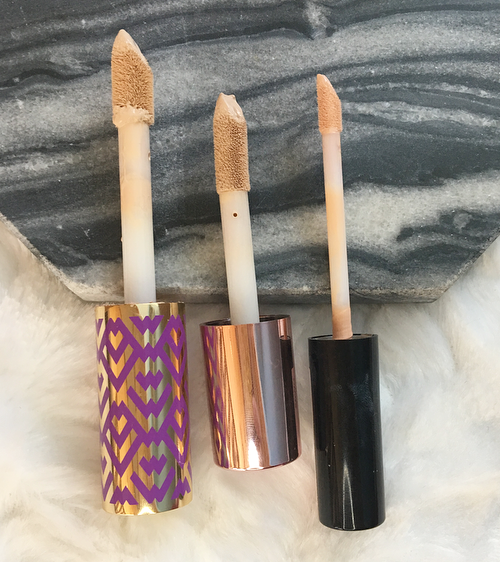 The Tarte concealer has the massive amount of 10 ml while the Conceal and Define has 3.4 ml. Even though you get less product, the Makeup Revolution concealer is still a better value at 0.48 ml per dollar compared to Tarte's 0.37 ml per dollar. 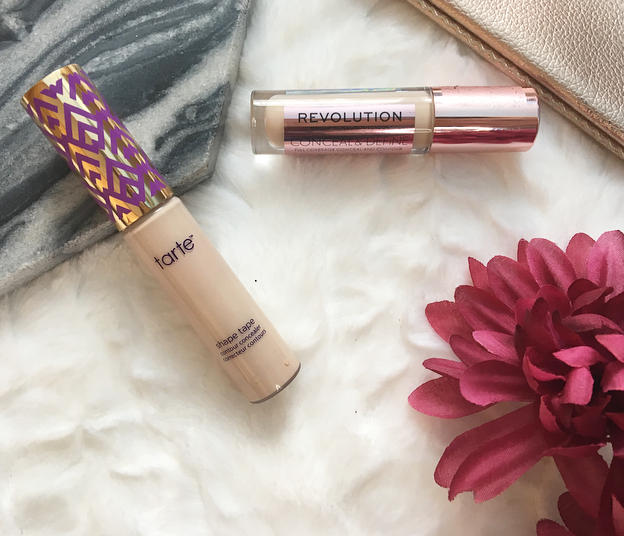 If you want to only purchase one concealer and have it last you for a long time, the Tarte one might be a better option for you, but if you are looking for the best value then it's Makeup Revolution all the way. When it comes to shade range, the drugstore option also comes out on top, which I'm glad to see! Tarte has 14 shades to choose from while Makeup Revolution released 18. I have the shade C2 from MUR, which is for fair skin with yellow undertones, and it's a great match for me. I have Fair Neutral in the Shape Tape formula which is a bit too light, but still usable. Now on to the formula of these two concealers! A product can't be considered a dupe unless it performs the same, after all, and in my experience I don't think that these products are very similar. The Shape Tape concealer has more coverage, but is also harder to blend and looks heavier on my dry skin. The Makeup Revolution concealer is much creamier and looks more natural, though it doesn't cover as well as the Tarte concealer. I think that the Makeup Revolution concealer is more comparable to the NARS Radiant Creamy or the Maybelline Fit Me. I set both of these concealers with a powder (the RCMA No Color powder) to ensure that they last all day, and I don't notice any creasing on my undereyes. Keep in mind that creasing isn't a major problem for me yet, so I can't guarantee you won't struggle with creases with either of these concealers. We're all different and prefer different things! I don't think that the Makeup Revolution Conceal and Define is a dupe for the Tarte Shape Tape, but in my opinion, it's even better. For my needs, it is the perfect concealer. It covers well, doesn't make my undereyes look dry, and it's easy to blend and apply. The Shape Tape is more high-maintenance and though it does have excellent coverage, I think it is too dry and hard to blend. If you are looking for a concealer that won't budge and covers the darkest of dark circles, the Shape Tape might still be the best option for you, but if you prefer something lighter and more radiant-looking, Conceal and Define is an exciting new product to check out! Both are great concealers, but my new favorite is from Makeup Revolution. 19 comments on "$7 Tarte Shape Tape Dupe? " I have read a lot of different posts now comparing to two but never with swatches! Who'd have thought the Makeup Revolution one would be better!? SO many people have been comparing and loving these two concealers... but I haven't tried either! I feel so behind on the times! Personally I don't support Tarte so I would opt for MUR concealer. I still have my Tarte Shape Tape concealer and I use it everyday but I won't support them anymore after all that hullaballoo of them not making dark enough shades with their new Shape Tape Foundation! I actually haven't tried either! I really want to try the tarte one but just haven't had the chance to! I've been wanting to try the shape tape concealer but haven't wanted to spent the money,I'll have to check out the other one. Oh you make me want this even more! I went to buy it recently and it was out of stock which was so annoying, definitely going to keep an eye out on it still though as it sounds perfect! Interesting post! I really love this concealer but have only tried samples of Shape Tape so couldn't comment on if it was a dupe. I was so excited when I saw this MUR one. Tarte is just too expensive for me so this was a great option. However, I'm still waiting for it to start delivering to my country (they announced soon) so I'm looking forward to it. i was hearing a lot about the MUR one and i am glad you said that it's like the maybellinbe fit me. i love the maybelline fit me and i am happy with it so i don't think i will get the MUR one. The MUR didn't work so well for me in terms of longevity :( it's still good for the price though!